Today, every business worth their salt must have a website. Over 75% of small businesses have a website, and that figure is growing. There is no reason why your business should be left out. Having a website is as essential as having a phone number for your business. You need a website for your new business. You might also need to revamp your website to meet with new web standards. Creating a website can be frustrating and tedious especially for those that are not web designers or those that can’t hire one. In this article, you will learn simple steps that will help you when building a website. You can do this yourself without hiring a web developer. You won’t even need to spend much money. Now you may be asking yourself “As a web design company, why would you give me tools to do something that I could pay you to do”? Easy, we believe that our expertise and service is what you are truly paying for when you hire us to build you a beautiful, mobile-friendly website. The tools are out there to build a great site on your own, if you have the extra time to take on the project. We are experts in our field and “time savers” for even our most tech savvy clients. On to the guide! First, you need to find a content management system for your business. There are several content management systems available. Each of them has their unique features and advantages. You need to examine them and pick the one that best meets your needs. There are content management systems that are great for eCommerce sites. Some are better for companies that want to have a blog section. Some will work better for other purposes. Some will allow you to code and make tweaks as you wish while some are less flexible. Some will give you some lovely templates that you can’t get from others. Some are free while others are paid. It’s up to you to make a choice. The next thing you need to do is to find a good domain name for your business. The domain name must reflect your business name or what you do. It should also be something that your customers can relate to and remember easily. A good domain name serves to establish your professionalism. If the domain name that you want has been taken, you can consider another extension like ‘.org’ instead of ‘.com’. Today, you can get good domain names at low prices. Sites like Namecheap, GoDaddy, NameSilo and other allow you to purchase domains at reasonable prices. There are several promo codes available that allow you get domains at discounted prices, so you can search for these promo codes before making your purchase. Some sites offer extra services like SSL security and others for additional fees. 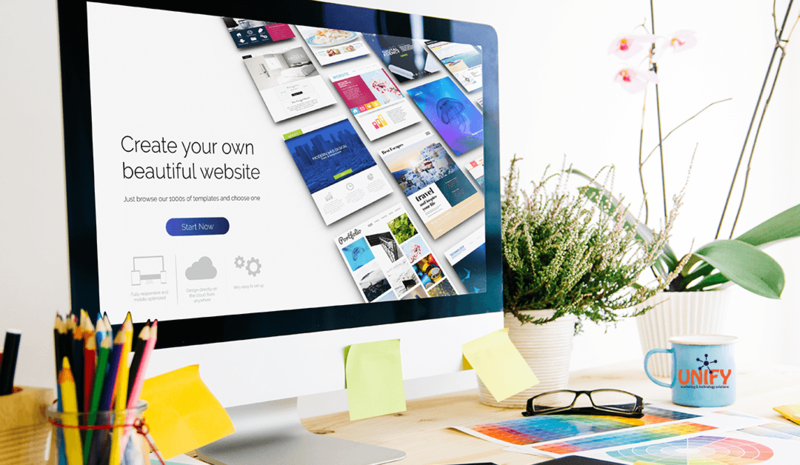 After selecting a CMS platform, you can go through the template and theme sections of the website and take your time in making a choice among the varieties on offer. You can look at other websites in your industry and see what they used to help you make a choice. Go for something creative but not overwhelming. Balance is the key. Choose a template that will appeal the most to your prospective customers. No matter the template that you select, ensure that it is a responsive one that will also look good on mobile devices. Also, consider the number of pages that the menu bar of the website will have. Ensure the template has good fonts that can be read easily by customers. Don’t use flashy backgrounds that will be too distractive or unprofessional. After you have selected a theme and a template, take time to customize and tweak it to your liking. Regardless of the content of your website, poor designs may put people off and prevent them from even reading the content. Today, people have a shorter attention span so you will need to do all you can to keep them attracted to your website. After selecting a template, it’s time to add web pages to your website. Before adding pages to the website, you need to make plans ahead and draw up plans for the pages that you want for your website. Most business websites have the following four pages at the minimum. You can’t go wrong with these four pages. You can also add other pages that are relevant or necessary as regards to your industry. You can visit the websites of your competitors and see how they arranged their pages. It’s also good to have a blog section page where you can share ideas and relevant information. A blog section will also boost your SEO rankings. It’s easy to remove and add pages as needed, so you can make necessary changes as you wish. Now, the next thing to do is to create content for your website. You can’t have empty pages on your website. You need to create content for them. You can start with a rough draft, then finetune it to make the final draft. Determine the tone of the write-ups and create your content with that tone. Show your drafts to people and listen to their opinions before uploading the final content to your website. You will also need to conduct some keyword research so that these keywords can be introduced to the content that you want to upload to your website. There are several online tools that can help you with keyword research. The home page should be a general introduction to your business and your services or products. The ‘About Us’ page should give them more information about you. Your ‘Contact Us’ page should contain information on how people can contact you to use your services. Tell them all about your services, how it can benefit them and what makes you better than your competitors. Put testimonials and other relevant information that will convert website visitors into paying customers. After creating content for the pages and uploading the content, you need to tweak the settings and make changes. Add a website title and taglines for your web pages. Check the website URLs and ensure that they are well-optimized for search engines. It’s time to install compatible plugins for your web. There are several plugins that will make your website more innovative and responsive. Examine your website and think of things that could make it better. Visit the plugin section of your CMS platform and check out plugins that you think will make your website better. You can add plugins for security, eCommerce and other things. After selecting good plugins, publish them and watch the effects on your website.